It was a warm spring morning, the first Saturday in May, and I heard the marimba music several blocks away. The joyful sounds drew me to Farmin Park where I found the grass and surrounding streets filled with vendors selling early veggies, cut flowers, and loads of bedding plants. 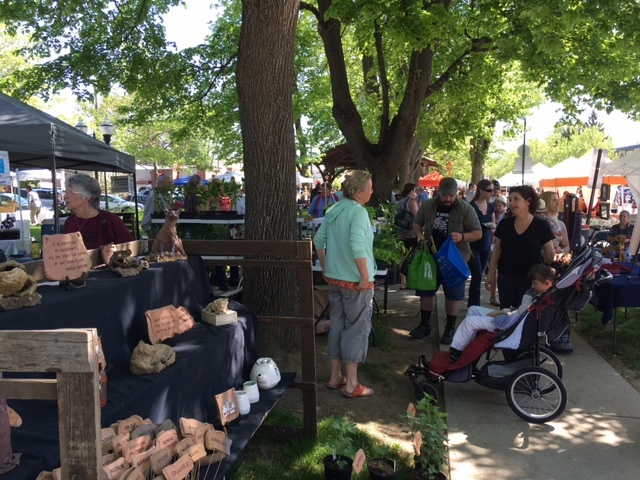 There were crowds of people there for the first day of the Farmers’ Market at Sandpoint, buying food, visiting with friends, and dancing to the music, all celebrating the start of our glorious North Idaho spring and summer. The market is going strong now, growing steadily from its small start in 1988 when just a handful of vendors gathered to sell garden produce. It was the brainchild of Lois Wythe, a master gardener who somehow knew that our area was ready for this type of venture. She printed flyers announcing a meeting and was surprised by the large crowd that showed up. Additional meetings followed to fine tune the plan, establish rules, and set the opening date for May 14, 1988, in Farmin Park. The location has remained the same but the market has expanded with booths filling the park and overflowing into and across Oak Street. It has become a vibrant part of the community and I’m sure that Lois would be immensely pleased. I’ve enjoyed the Farmers’ Market for 28 years now and always assumed that it was a modern idea, a way to connect small-scale farmers with people who wanted tomatoes so fresh that they still held the warmth of the summer sun. I was surprised then, while researching a different topic, to find references to another farmers’ market, and I knew that someday I would have to find out more. It turns out that the first Farmers’ Market took place just over 100 years ago, on the Tuesday before Thanksgiving in 1915. Members of the Sandpoint Commercial Club had suggested the market idea as a way to encourage agriculture in the surrounding region. Sandpoint was a lumber town then, but huge tracts of land had been clearcut and were being sold as “stump ranches.” Farmers were gradually improving this land and needed to find markets for their products. In turn, local merchants understood that any money earned by the farmers would be spent at stores in town so they supported the idea of this market. The first farmers’ market opened in late 1915 in a vacant store on the first floor of the St. James Hotel. The Pend d’Oreille Winery now fills the same space with a tasting room and gift shop. 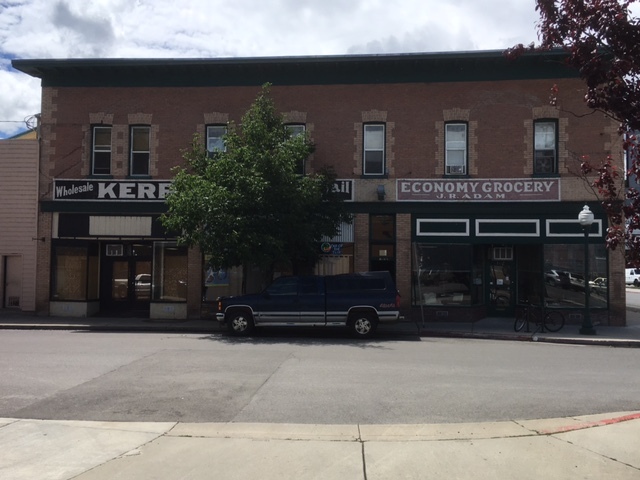 The Krebs Building once housed Kerr & Nead Grocery as well as the Economy Grocery. The farmers’ market then apparently went dormant for nearly three years until the idea was revived, this time with both state and local backing. Charles Waggoner came to Sandpoint in early September 1918 to encourage local farmers to participate in a new market. He had been organizing similar ventures around North Idaho as part of his work with the state bureau of farm markets. 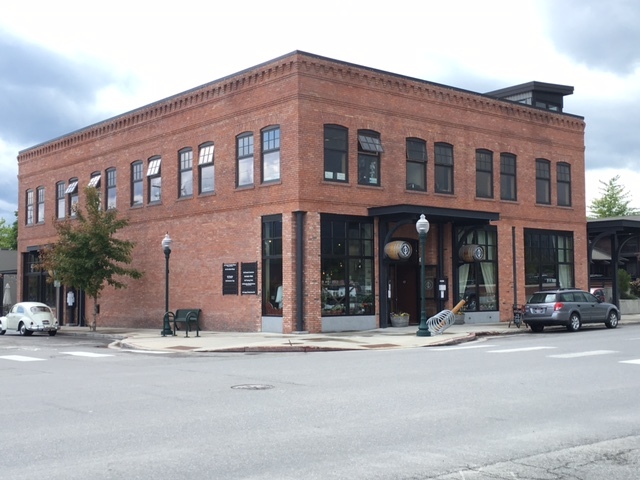 While here, Waggoner met with members of the Sandpoint City Council to get their backing for a new farmers’ market. 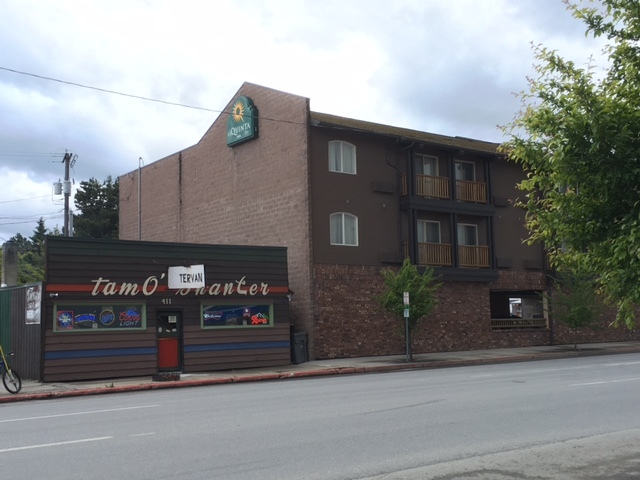 City officials were quick to back the proposition and agreed to lease the vacant lot between Cedar and Main Streets, just east of the Spokane International tracks, where La Quinta Inn stands today. Less than two week later, the Sandpoint farmers’ market opened on a Saturday morning with great success. Mrs. Emma Weaver had twenty-five varieties of fruits and vegetables for sale, garnering her first prize – a $3.50 pair of shoes from J.A. Foster & Co. Joe Sitko won the second prize for his fourteen different kinds of fresh produce. The market, which was open every Wednesday and Saturday morning, continued to draw both buyers and sellers. Farmers sold seventeen loads of produce one morning in October, despite the cold and rainy weather. The market gained stability through active participation and encouragement from city officials, the Bonner County Farm Bureau, and the state. The city council passed special ordinances to regulate the market and began looking into securing a permanent location. Edgar Ludwick, the county farm agent, pushed for regulations, not only to ensure a clean market area but also to limit the number of sellers so that the supply of perishable produce did not exceed the demand. 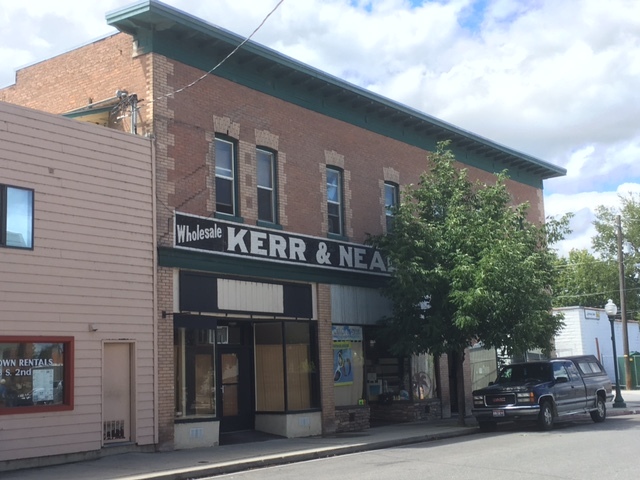 Krebs Building, home of Kerr & Nead as well as Economy Grocery. Cold weather drove the market indoors by January 1919. Growers once again were back in a vacant store in the Krebs building on the corner of Second and Pine, next to the Economy Grocery. This was only a temporary solution, however, because others were working to build a row of booths on the vacant city lot where this market began. The 24×62 foot structure, located on Cedar Street just west of today’s Tam O’Shanter (better known as the Tervan), had eight stalls. The two that were designated for selling meat had a concrete floor and were screened. Farmers wanting to sell at the market paid rent on market days to offset the construction costs incurred by the city. The public market stalls were located on Cedar where LaQuinta Inn stands today. This new market place opened by early September 1919 with all of the sellers decked out in white aprons. Prices were standardized, with maximum charges established by a committee from the Bonner County Farm Bureau. Other regulations stipulated that any food products that needed to be wrapped had to use clean wrapping paper, all part of an effort to maintain sanitation levels. 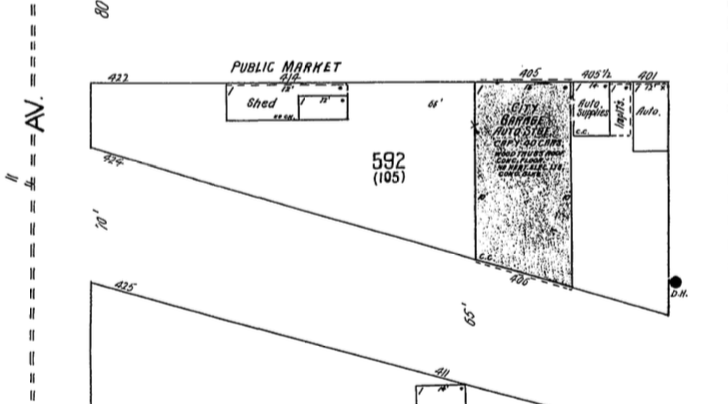 Detail of Sanborn Fire Map (August 1921, p. 13) showing Public Market on Cedar Street. I do not know just how long this farmers’ market lasted. It continued at least into 1921 since the building is clearly labeled “Public Market” on the 1921 Sanborn fire map. The building was still there in 1948 but used for plumbing and tire sales. La Quinta Inn rises tall above the former market site, just a block away from Farmin Park which fills every Wednesday afternoon and Saturday morning with garden produce, crafts, music, and a friendly crowd of people from May to October. I’ll see you there soon! 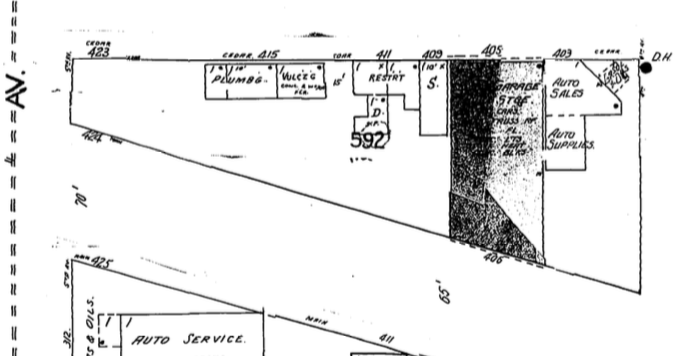 Detail of Sanborn Fire Map (July 1948, p. 13) showing former public market on Cedar Street. “New farmers market ready for spring season,” Daily Bee/North Idaho Sunday, 1 May 1988, D-1; “Market Day Is Set For Next Tuesday,” Northern Idaho News, 16 November 1915, 1:4; “Market Day Promises Well,” Northern Idaho News, 23 November 1915, 1:3; “Market Day Proves To Be Popular Idea,” Northern Idaho News, 30 November 1915, 1:5; “Favors Market Day,” Northern Idaho News, 30 November 1915, 1:5; “Market Day Idea Increases In Favor,” Northern Idaho News, 14 December 1915, 1:6; “A Sale Each Day,” Northern Idaho News, 21 December 1915, 1:2; “To Establish Market Saturday Sept. 14,” Northern Idaho News, 10 September 1918, 1:2; “The Farm Markets,” Northern Idaho News, 24 September 1918, 1:5; “Farm Markets Promising,” Northern Idaho News, 8 October 1918, 1:5; “Farmers’ Meetings,” Northern Idaho News, 7 January 1919, 1:4; Edgar L. Ludwick, “Farmers’ Market Should Be For The Benefit Of All Concerned,” Northern Idaho News, 21 January 1919, 1:3-5; “Farmers’ Market To Have New Location,” Northern Idaho News, 21 January 1919, 1:5; “Begin Work On Stalls For Farmers Market,” Northern Idaho News, 19 August 1919, 1:6; “Market Building Near Completion,” Northern Idaho News, 26 August 1919, 1:2; “Wear White Aprons At Farmers Market,” Northern Idaho News, 16 September 1919, 6:4-5; Map of Sandpoint, Idaho (New York: Sanborn Map Company, December 1915:7, August 1921:13, July 1948:13). This entry was posted in Uncategorized and tagged Bonner County agriculture, Bonner County history, Sandpoint Farmers Market, Sandpoint history, Sandpoint Idaho. Bookmark the permalink. Thank you so much for archiving the farmers market history in Sandpoint. Well written and well said. I’m proud to have been a part of our local marketplace for the past 26 years. We have an amazing group of dedicated farmers here in north Idaho and a fine heritage to continue! Thanks, Diane! I appreciate your help with the clippings! Actually I have found a bit of info on the Tervan. Who knows where it might lead…! but you seem like you understand what you’re talking about!